Friday morning Ana looked great. She was back on feeds and playing. Discharge was around 10:15AM and we headed to the car with her in her wheelchair. When I was loading her she told me she felt weird and her head was weird. Thinking it would pass, we headed home. About an hour into our trip, Ana started with severe back and head pain. Shortly after that the retching started and we had to stop feeds and call the doctor at MUSC. He decided we should continue home and start her on Tylenol with Codeine... this didn't help much at all. As the day progressed we were able to get her back on feeds, but before long she was sick again and nothing stayed down. After several calls to her doctors, 12 hours of crying, and the inability to give her feeds, we decided it was time to return to MUSC. We left our house at 12:30AM and arrived at MUSC around 2:30AM. Ana retched the entire 2 hours and cried with back and head pain. 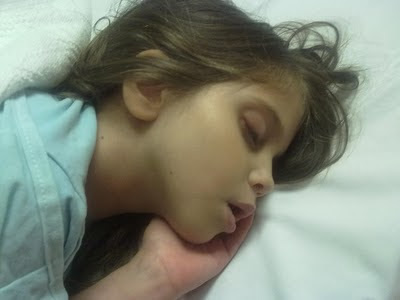 As soon as we arrived at the ER they took her back, ran some tests, and started fluids via I.V. The decision was to admit until she is pain free and tolerating g-tube feeds. If she sits up or stands she has severe head and back pain with retching. She does better lying flat, but still complains of pain in her left side. The doctors are waiting to see if it gets better. There is a small possibility she could have a CSF fluid leak from the Lumbar Puncture. If there is a leak they will do a blood patch, but only time will tell. So, for now, we sit and we wait. Please keep Ana in your prayers. We know God has a perfect plan and we know He is faithful. We trust in Him. 7Therefore be patient, brethren, until the coming of the Lord The farmer waits for the precious produce of the soil, being patient about it, until it gets the early and late rains. 8You too be patient; strengthen your hearts, for the coming of the Lord is near. 9Do not complain, brethren, against one another, so that you yourselves may not be judged; behold, the Judge is standing right at the door. 10As an example, brethren, of suffering and patience, take the prophets who spoke in the name of the Lord. 11We count those blessed who endured You have heard of the endurance of Job and have seen the outcome of the Lord's dealings, that the Lord is full of compassion and is merciful. 12But above all, my brethren, do not swear, either by heaven or by earth or with any other oath; but your yes is to be yes, and your no, no, so that you may not fall under judgment. 13Is anyone among you suffering? Then he must pray Is anyone cheerful? He is to sing praises. 15and the prayer offered in faith will restore the one who is sick, and the Lord will raise him up, and if he has committed sins, they will be forgiven him. 16Therefore, confess your sins to one another, and pray for one another so that you may be healed The effective prayer of a righteous man can accomplish much. 17Elijah was a man with a nature like ours, and he prayed earnestly that it would not rain, and it did not rain on the earth for three years and six months. 18Then he prayed again, and the sky poured rain and the earth produced its fruit. 20let him know that he who turns a sinner from the error of his way will save his soul from death and will cover a multitude of sins.